Of Sun-Tzu’s nine grounds, wage war on only one. Ground nine. The main difference between successful speculators, the 5%, and the majority, is how they approach speculation and investment. The 95% attempt to pick lows in a downtrend and pick highs in an uptrend. The 5% know this is the road to the poorhouse, and they approach speculation and investing, from real estate to cryptocurrency — and everything in between as a business. If a building company places a bid to develop on land, they have to submit plans to the relevant authorities. This includes paying for expertise, like employing architects and ground engineers — experts, who design the living space and measure the impact and stress of the proposed new development on the existing infrastructure. The building company not only has to satisfy the requirements of authorities, but they are also, most of the time, in competition with other builders. They don’t get awarded every contract they bid for. For the building company, losing a bid is not a surprise. Bidding on development projects is an overhead cost of being in business. Like the building company that has to bid on a development, to be awarded the contract, speculators have to bid on a position, if they want to build a position in a market. The 5% engage with the business of market speculation, just like the building company, who price their bids according to their expectation of success, factoring in lost bids because they don’t expect to win every bid they make. It’s called expectancy. And, before the 5% engage with the enemy, they have studied the lay of the land, and know the expected cost. Like the building company, the 5% know without reasonably accurate expectations, they have little chance of remaining in business. Bottom picking is a nasty habit. Don’t do it. The majority of market participants use technical analysis combined with a rush of excitement caused by bullish articles written by market gurus. The 95% look at charts in hindsight and measure the paper profits. A narrative runs through their mind, “If I would have bought here, I could have made thousands.” This tape runs in the 95%’s head. They measure from the low to a recent high and calculate what could have been and what to do with the profits. Inevitably, the 95% read the charts after the fact, when the move is already underway; then, after reading bullish social media comments and opinions, they can’t stand it any longer and will do almost anything to will their dreams into reality. This scenario is one of the leading causes of the 95%’s failure. They enter late, out of position, with no expectation of the cost of doing business. In ShapeShifter and Revolver, we discussed expectancy. The concept (and formula) is simple. Expectancy is the tool, that when combined with money management and position sizing, that promotes members of the 95% into the winner's enclosure. Successful speculators use the expectancy of a technique or entry as a filter to either pass or fail an investment idea. There are eighteen red pockets out of a total of thirty-eight. The percentage win is eighteen divided by thirty-eight. With a one dollar bet you’ll win two dollars if the ball lands in a red pocket. But there are thirty-eight minus eighteen pockets that aren’t red, and this is your percent loss. If you bet one dollar, then your average loss will be one dollar. ((18/38) $2) - ((20/38) $1) = - 0.0526 cents. Over time you can expect to lose -0.0526 cents. In other words for every one dollar you give the casino on average they will give you 94.74 cents back. Roulette is a negative expectancy game. Casino’s make millions in profit from roulette, because on average, the casino makes five cents on every dollar played. Over time and millions and millions of games, those five cents add up. If roulette were a trading strategy, the 5% would reject it, because of its negative expectancy. The 95% think profits are made by buying at a low price and selling at a higher price, and most traders believe there’s only one way to trade a market, and that’s is directionally, but they’re wrong. In Top Ticked we discussed commodity trading as it was when the movie Trading Places was released, and as it is today. In the early 1980s trading was conducted in trading pits, with floor traders shouting out orders, confirmed with hand signals. Today, the pits are quiet, and in 2019, most of the trades going through exchanges are automated computer-driven transactions. Generally, there are two types of trading strategies. The first is directional, buying low and selling high, positioning for an up move, or selling high and buying back low for a down move. Directional trading is profitable if a market is trending. Either up or down. But if the market being traded is in a sideways movement, then attempting to take directional positions is not a profitable strategy. Because of expectancy. Professional traders break their capital down into units. To enter a position, winning traders risk one unit, remember this is like a building company bidding for a project, and they have an expectation of how often a strategy is likely to be profitable. For example, if a market is trending, they expect to make three units profit for every one unit risked. If you plug these numbers into the simple expectancy formula of (%WIN x AVERAGE WIN) - (%LOSS x AVERAGE LOSS), where three is the average win, and one is the average loss, consistent traders solve for percent win to figure out how often they need to win at a minimum to break even. In making three when they win and losing one when they lose, it’s trivial to find the breakeven. Losing one seven times out of ten, 70% of the time, they only have to win 23.34% (rounded) of the time to breakeven. (23.34% x 3) - (70% x 1) = Zero. Rounding up, the 5% know they can be wrong seven out of ten times, but if they are right just three times out of ten, they’ll make a small profit or just breakeven, because of trading slippage and trade commissions. Using expectancy to figure out the breakeven costs of a strategy, once the breakeven costs have been estimated, the 5% create strategies that have a chance of producing favourable win/loss ratio and risk/reward trades. Rather than chase trades, or listen to opinions, the 5% test strategies that can outperform the minimum requirements to break even. The 5% adjust their expectations depending on the market conditions. Trying to achieve three to one reward to risk by trading directionally in a sideways non-trending market is like playing roulette in a casino. It’s a negative expectancy situation. This is why they use the price cycle. We’ve discussed the price cycle in Deus Ex, Machine Gun Preacher, Smart Dust, First Order, Sugar Rush, Emotional Rescue, SteamPunk, Choke Point, Dark Pools, and SubAtomic. Why? Because understanding where price is in relation to this cycle affects the strategies deployed by the 5%. Attempting to achieve a three to one reward for risk taken while trading sideways in an accumulation phase of the price cycle is not the optimum strategy for this situation. Some might disagree, arguing that a trend can be found in any market situation, and that to a certain extent is true. For example, in a sideways accumulation phase, by moving down to a 30-minute timeframe and lower, a trend can be found. The critical question is, what is the trading strategy? Because when moving down to a 30-minute trend or lower, the trend, at best will last a day, maybe two. And this is what happens. Attempting to find an edge, the majority find themselves trading shorter and shorter timeframes. The 95% don’t adjust their strategies depending on conditions, and they don’t monitor the strategies they use. Consistent speculators don’t just adjust strategies, dependent on where in the price cycle they are trading, they also follow the performance of the strategies they use, not only in testing before they use them but in real time. If a strategy the 5% are using underperforms, they have a business plan that switches that particular strategy off. But, and this is key, even though the strategy is turned off, the 5% keep monitoring the strategy in real time, recording the wins, losses, and reward to risk, as if it was with real cash until the system becomes profitable again. Generally, winning traders don’t attempt to pick bottoms for a directional trade, but they do take positions at lows using strategies designed to take advantage of extreme levels of implied volatility. Rather than use the same techniques they change their approach depending on the background conditions, but not only that, they also maintain and observe their equity curve performance, not just in terms of how much net profit they are making, but also in terms of how much net profit they are making as a ratio of risk taken. Like the nine grounds used by Sun-Tzu, have the cryptocurrency markets shifted ground from sideways accumulation after a down move and are they transitioning into a new uptrend? Instead of reading the opinions of others, reacting to the noise from social media, and hoping to make a profit, the 5% use the market itself to give them information. Most traders look for confirmation from an authority figure that a new uptrend is in place. If you think about this, you’ll realise why this is a waste of energy, and why it’s emotionally draining. Only later, after the trend has recorded the ups and downs, only then, when troughs sit on top of peaks, only after the price has crossed the two hundred day moving average, is the trend known. The problem is, by the time the trend is evident to all, a large percentage of the move has already taken place. And this is ok. Many traders don’t try and trade the trend turn, preferring instead to enter positions in an obvious uptrend. What is an obvious uptrend? A straightforward way to think about it is to enclose the peaks and troughs of a trend into a channel, it’s not necessary to draw the lines, they are easy enough to visualise. If the channel is angled between thirty and forty-five degrees and is pointing up, it’s an uptrend, vice versa for a downtrend. Using the channel, trend followers look to enter positions in a zone close to the lower channel boundary. Why? It’s because this strategy has the highest likelihood of success if the market is in an uptrend, and because if the entry fails, the failure gives direct market feedback of a market that is not acting right, and the trend is more likely to have a deep correction or fail. While the 95% look to others for certainty, the 5% treat speculation as a business. They know this: nobody knows what will happen tomorrow. Imagine a clay jar full of jelly beans, coloured green and red. If no one knew the distribution of the beans inside the jar, how many green beans compared to red beans, then betting on which colour bean they would draw would be 100% guesswork. But if you knew the beans inside the jar are 60% green and 40% red, then you would have an edge. If you were offered even odds of 1:1, winning $100 when you pick a green jelly bean and losing $100 when you don’t, you’d bet on green. $20 profit divided by the average risk of $100 gives a dollar risk expectancy of +20%. In other words, for every $100 you risk, you’d expect to get your $100 back and receive a $20 profit. In 2019, most of the world’s largest investment funds can be thought of as a collection of algorithms, because most of the volume turnover is now computer generated. The funds run their algorithms constantly, recording the performance of each strategy. If a strategy underperforms they switch it off, but they keep recording its performance, only switching the strategy back to using actual money when it performs as expected. 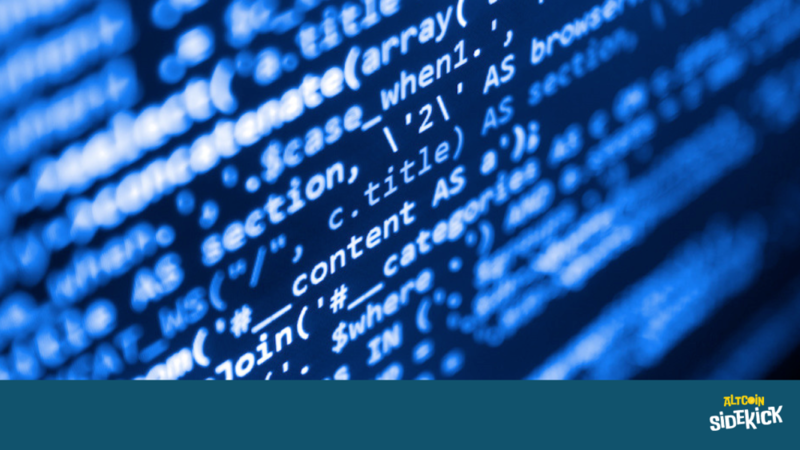 Generally, think of funds as a collection of algorithms that are being monitored continuously. There are two basic types of strategy. Directional, and non-directional. Directional trades will outperform non-directional trades when the market is either in an uptrend or a downtrend, but when the market is trading sideways like Bitcoin during 2018, non-directional strategies will be more profitable. Although no one knows how many beans there are in the jar, the 5%, by monitoring the performance of a collection of strategies, can build an accurate enough guesstimation of the distribution of jelly beans. Exact? No, but close enough. Bitcoin bottomed on the 6th February 2018 with an emotion bar low. Over the next nine months, Bitcoin rallied in a series of moves lasting 14, 34, 25, and 21 days. After the final rally Bitcoin went into stasis. Volatility dropped, and Bitcoin traded within a $700 range for 66 days. 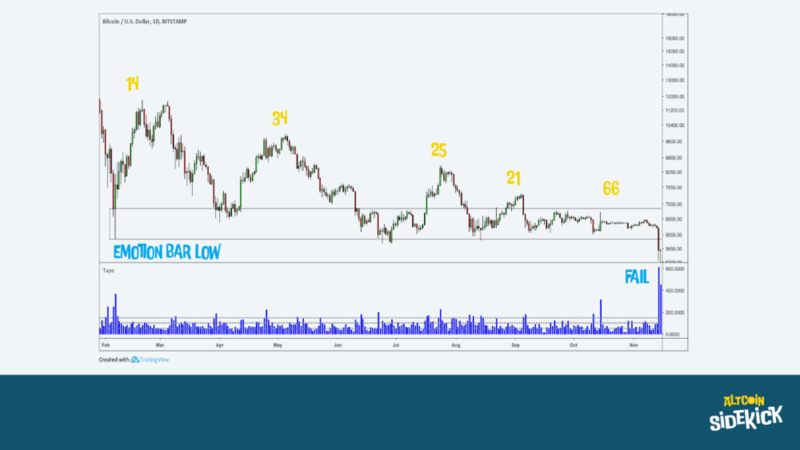 If this range, between the 6th February 2018 and the 14th of November 2018 was stage two of the price cycle, a sideways distribution after a downtrend, then on the days leading up to November 14th the highest likelihood was for Bitcoin to test the support built against the 6th February low over the following nine months. This zone was between $6,800 and $5,700. If a high volume, wide-ranging, bar, closing in the top half of the range had occurred, then, the highest likelihood would have been for a significant rally from that level. But this is not what happened. Instead, on November 14th, 2018 Bitcoin dropped nearly $1,000 on massive volume, 615% greater than average. The close of the bar was approximately 25% up from the low. If the 25% rally off the low were buying then, new demand would be expected to hold the market, but the next day, on the 15th, Bitcoin dropped another $450 before ending the day closing at the opening price, right at the previous day’s close. This action happened on 453% of average volume, indicating that demand was holding the supply. If prices were to rally, new demand would be needed, but Bitcoin traded within a tight range for the next few days inside the selling tail of the November 14th move. The 5% take notice of the location of the price action after the 15th of November. It’s underneath what was previous support, indicating that this support was now resistance. Any rally into the resistance zone would be shorted. Why? In 2018, over nine months a clear zone of demand buying held Bitcoin up, think of this a cause. Generally, the longer the period of the cause, the greater the expected magnitude of the rally from it, when it occurs, but if a cause built up over a long period fails then prices are expected to move down away from that level with high momentum. As the 5% watch the price cycle, they are recording the length of the cause, because like a coiled spring, the longer the time, the greater the compression, and the greater the compression, the more violent the move away from the compression will be. Inside a sideways accumulation move, after a downtrend, as the cause is being built, there are signature moves that help the 5% build up a story of the battle between supply and demand. If demand wins the battle, the longer the duration of the cause, the greater the effect of that cause. The effect of the cause is the move away from the coiled spring. If demand loses, the greater the effect, only this time to the downside. Bitcoin bottomed on the 15th December 2018 around $3,125. This time instead of recording an emotion bar low, Bitcoin made a low on a narrow range bar with very low volume. The low was preceded by two previous emotion bars on the 25th of November and the 7th of December. Most lows, after a move down end in either an emotion bar, a no interest bar, or a compression bar. Which bar is more likely to happen depends on the location of the price from the original high of the downtrend, in Bitcoin’s case, the December 2017 high. In late February 2019, Bitcoin and the leading alt-coins, most of whom were dragged down with Bitcoin, are building causes. The question is when will the cause have the effect of moving the cryptocurrency markets higher? On October 19th, 1987, the global stock markets crashed. The Dow Jones Industrial Average lost 22.5% in one day. Imagine waking up to the news the Dow is down 5,850 points. That’s what a move equal to the 1987 crash would look like today. Companies that held up better than the others during the crash went on to outperform. Take Nike. During the crash, Nike’s price dropped to split adjusted 22 cents a share. Thirty-two years later Nike is trading at around $85. That’s a compound growth rate of 21.18%. Using the rule of 72, 21.18% compound growth doubles your money every 3.4 years. Relative strength is a quick way to find stocks that are outperforming the stock indexes, and it’s also an efficient way of finding cryptocurrencies that are outperforming the current market leader, by volume and market capitalisation, Bitcoin. Since Bitcoin bottomed in mid-December 2018, Litecoin, EOS, Ontology, SolarCoin, and Tron, are all outperforming Bitcoin on a relative strength basis, and they all have a market cap of at least $1 billion, except Ontology that’s currency valued at $900 million. What this group of outperformers, by relative strength, have in common is they have all broken out of previous highs on high volume price action. 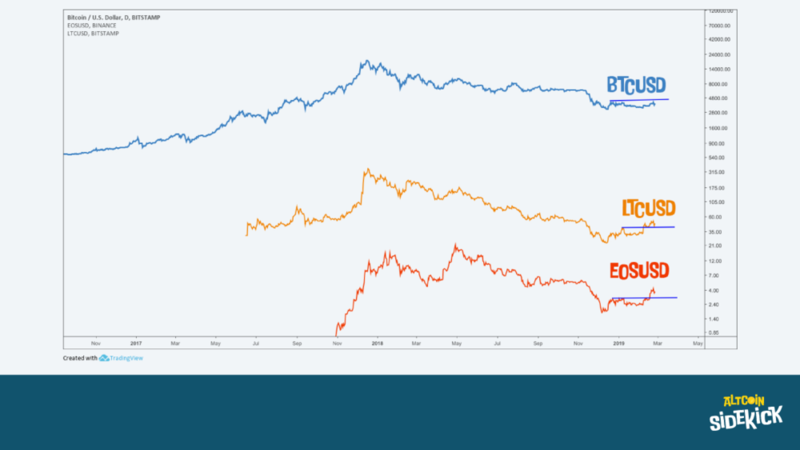 In contrast, on a relative strength basis, Ethereum is also outperforming Bitcoin, but Ethereum hasn’t broken out of previous highs on high volume. This information is not in any way a recommendation to buy, or sell, rather its a visual way to interpret the algorithms used by the big players. The 5% use various analytical techniques to adjust their strategies. Big players, run algorithms and record the equity curve performance of their algos, even though they only run a subset of them at any one time with live money. This way the bigger players can use direct market feedback, dependent on the performance of the algos. Some algorithms are designed to work best in a high implied volatility environment (see The 4th Dimension), and some work best in a low volatility trending environment. Depending on the location of the price action within the price cycle framework, high volume up bars can either indicate bearish or neutral behaviour or in certain circumstances bullish behaviour. One of the circumstances where high volume bars indicate bullish behaviour is when they occur in sideways moves with price breaking out of a previous high. Markets move because of imbalances of supply and demand. If during a sideways move, prices move to a previous high and then fail, returning to test the lows of the range, this indicates the existence of overhead supply at and above the highs. If price can move above the previous highs on high volume, then this is an indicator that new demand, buying, has absorbed any sitting supply above the highs. Without further resistance caused by overhead supply, prices can go up on less buying. This is why, if you take the time to study volume and trend moves, once overhead supply is removed by a high ratio of buying, it takes less buy orders to move prices higher. With overhead supply, prices move as though running through knee-high mud, without the overhead supply prices move into firm dry terrain. This is Sun Tzu’s ninth ground. The death ground. On this terrain, Sun Tzu engages the enemy, and the battle is fought. Survival in speculation, not only depends on being able to guesstimate the ratio of jelly bean distribution in a jar, or in other words, be able to structure a campaign because you have superior information to your opponents, it also relies on you committing your forces in the right proportion. And in speculation and investing, positioning with the right proportion means using money management and position sizing. Without these two allies, no strategy will work, no matter which ground you fight on. Holding the high firm ground is just one part of the puzzle, supplying your men is where the real battle is fought.